In an age where people stream music instead of buying it, how do you build something equivalent to a pre-order campaign for upcoming releases? The answer is to create a “pre-save” campaign, akin to a landing page where fans can authorise you to automatically add a new song, EP or album to their steaming library or playlist of their choice as soon as it becomes available. However, pre-save tools for Spotify — if you even knew they existed — are often perceived as expensive and solely for use at major labels or established music marketing companies. Now music marketing and technology startup Feature.fm wants to change that with its “Ultimate Pre-Save,’ a free tool for artists or labels of any size. 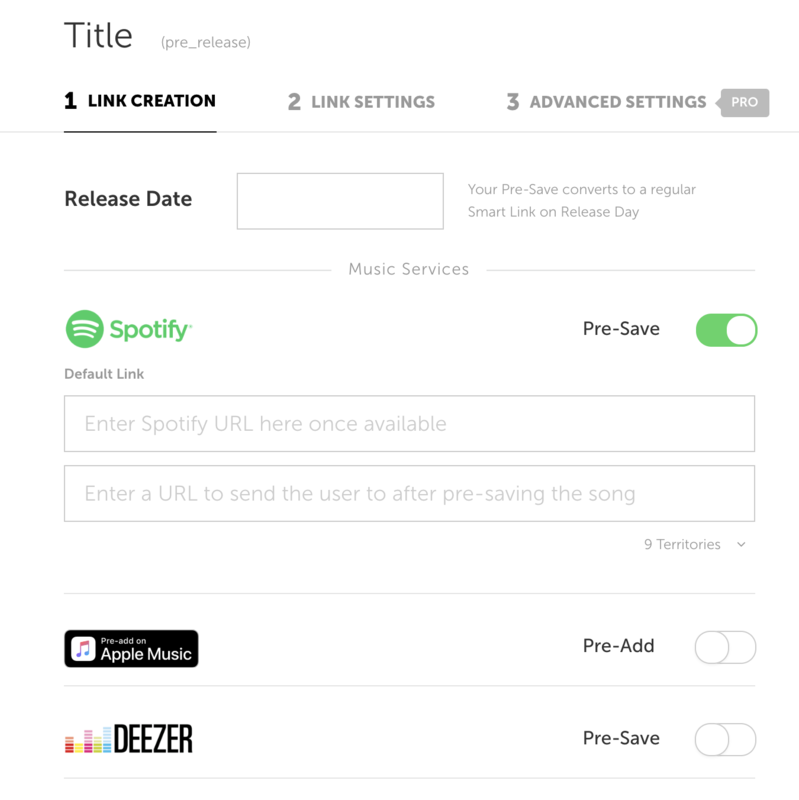 Better yet, the Ultimate Pre-Save tool also supports Apple’s newly launched “Pre-Add” feature, which works in a similar way to a Spotify pre-save. Deezer’s version of pre-save is supported too. The set up process is simple. You register with Feature.fm as either an individual artist or label, select the Ultimate Pre-Save tool and click on create new pre-save. Next you are required to give the work a launch date and tell it which of the three services you plan to launch on. You then need to add a title, an image, preview link, and make any changes to the standard text. Later on, once you know the final URL for your new release on each respective service, you add that too. And that’s pretty much it. Your fully functioning pre-save page is built, ready for you to start sharing/promoting and hopefully have a successful Day One launch. Meanwhile, any fan who lands on your pre-save page can click “Pre-Save” or “Pre-Add” to get your music into their libraries on release day. They’ll also automatically follow your artist page if they don’t already. You also have the option to re-direct them to a different URL afterwards so you can reward fans with things like exclusive content or contests. One other useful feature is that the Feature.fm pre-save link automatically converts to a “smart link” once the song/album is released. So up until release the message will be “pre-save on Spotify, Apple Music or Deezer” etc. and then after release day the link automatically switches to a “buy or stream on your preferred service” and pulls in other digital music services too e.g. Amazon and Tidal etc. The idea is that you only need one smart link for the entire life of a campaign. Other than that, you can capture/collect up to 50 fan emails for free, and get access to click and pre-save counts. There is also the option to pay for some advanced features, such as custom domains, either monthly or as a one-off campaign. And of course Feature.fm wants to up-sell you to a host of other marketing tech features, such as its incredibly easy to use music ad tools, deeper analytics, and the ability to send remarketing data to your Facebook Ads, Google AdWords, and other ad programs.